Getting the youngest members of Gen Z to try new foods can be like trying to get a leopard to wash off its spots. It’s not likely. Even so, that young generation’s parents want to try: About 40 percent of Millennials are now parents, and close to 75 percent of Millennial moms are self-proclaimed foodies that want to introduce their young children to different cuisines and flavors. Juicy Juice, with its line of 16 flavors of 100-percent juice has found a way. It’s a clever route that runs through Millennial parents and on down to their young children. Gen Z consumers range in age from two to 19. 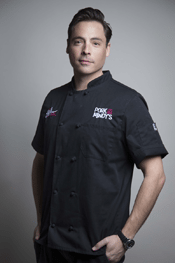 The brand has teamed up with Food Network Star—and funny man—Jeff Mauro to help kids expand Gen Z taste palates and get more involved in cooking with original recipes and tips that include its juice line. A new “flavor exploration” website includes exclusive content for families, including original recipies, cooking tips and a soon-to-be-released three-part video series. Games, puzzles and other activities offer the chance to win daily prizes and keep young visitors engaged with the site. For example, parents can let kids pour Juicy Juice for a sauce or into a smoothie to encourage them to try what they themselves helped make. Or, education can be used as a way to incorporate the juices, like asking the child “what is a kiwi?” and then introducing the Kiwi Strawberry Flavor to a shake. “Chef Jeff shares our commitment to food and family, and we’re thrilled to partner with him to make it easy for parents and fun for kids to discover something new together,” says Ilene Bergenfeld, CMO at parent company Harvest Hill Beverage Co. The site is being promoted through Juicy Juice social platforms, including Twitter. Mauro is the cohost of Food Network’s hit daytime show The Kitchen and star of the network’s Sandwich King. He is the partner and executive chef of Pork & Mindy’s restaurants and retail line of sauces, meats and legendary Pig Candy.